MP3 is a widely used audio format that is compatible with almost all operating systems. To make ringtones on iOS devices, you must have the music in M4R format. You can take advantage of the video converter to help you get the work done. This guide will show you how to easily convert MP3 to M4R files so you can use them on your iPhone. KeepVid Online Video Converter is a free solution to convert MP3 to M4R format online. This is an online converter site and it doesn’t ask you to install any other software. You can also convert MP3, FLV, AVI and many more formats to M4R format using this online website. This website is supports 50 formats to convert audio and videos without any charge for free. 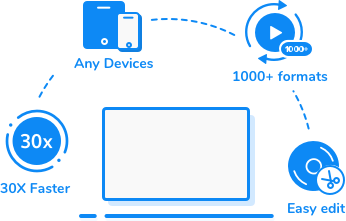 With the online video converter, you’ll just need to upload the file into the website, and then download it when the conversion finishes. KeepVid Video Converter is a desktop MP3 to M4R converter which converts your audio to M4R format. This converter helps you to convert videos to more than 1000 video and audio formats with ease. This video converter is a multifunctional program and it enables you to convert, edit and download videos with powerful features. It enables you to convert videos without any limit, and it provides you a 30x faster converting speed than other any video converter.  Convert video and audio files to more than 1000 video and audio formats. Edit videos with trimming, cropping and effects features. Download and install KeepVid Video Converter on your computer, and then start it. After that, select the Convert section at the top middle of the main interface. Click the Add File or Add Folder button at the upper left corner of the main interface, and add the MP3 file from your computer to the program. You’re also allowed to drag and drop the MP3 file into the program window directly. 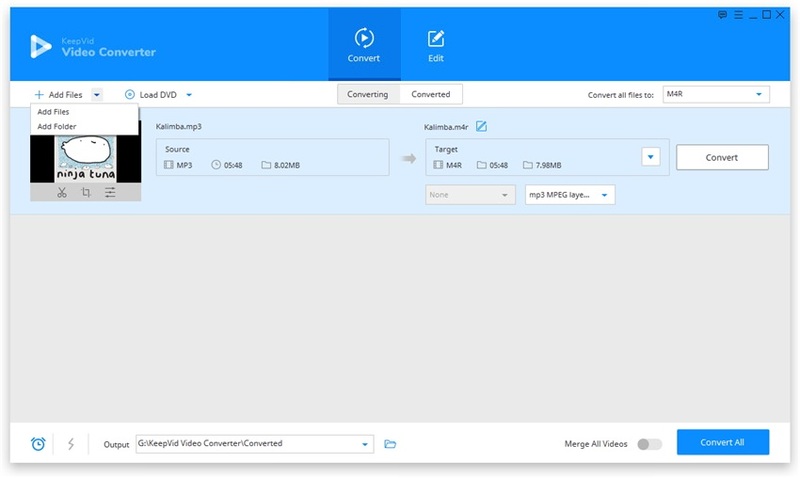 KeepVid Video Converter will load the video and display the detailed information of the file. Now you can click the inverted triangle icon beside the Target area, and choose M4R as an output in the pop-up window. You can also click the inverted triangle beside the Convert all files to button, and choose M4R in the pop-up window. After that, click Convert or Convert All button to start converting MP3 to M4R file. M4R extension files are iTunes ringtone files. These files can be transferred to iPhone easily and used as the ringtone for the iOS devices. M4R files can be opened in the iTunes program, VLC software or some other media players because they are not copy protected.